tl;dr; We often spend too much time myopically focused on the processes and direct outputs of our work. We must remind ourselves to see the whole by examining the structures (context) that constrain our work and its outcomes (consequences). In my consulting work over the past few years, I’ve had the privilege of working with many colleagues, and sometimes I get to blend ideas together in ways that seem to capture a simplicity and general application. 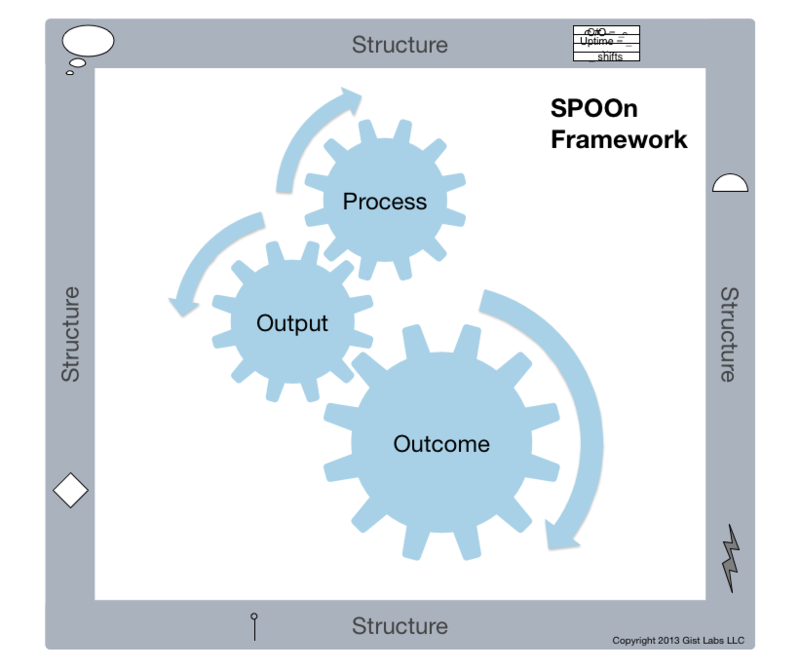 One such blending is SPOOn, which combines the Structure-Process-Outcome framework from Luke Hohmann with the Process-Output-Outcome framework from Israel Gat. See Luke’s book “Journey of the Software Professional” and Israel’s post http://blog.cutter.com/2012/09/05/pursuing-velocity/ for references. In fact, we spend so much time wrestling with these topics that we often ignore the bigger picture. 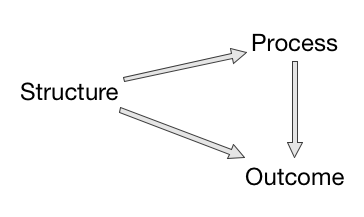 What context (structure) is constraining the execution of this process or defining the output? Do the outputs actually make a positive difference in the overall result (outcome)? These questions are much, much more important than trying harder to adhere to the letter of some process or squeeze one more ounce of efficiently into an output. From Luke Hohmann’s book, I’ve clearly understood that every process exists within some structure. The structure both supports and constrains our activities. Structures can be in our head (mental models and world views) or baked into our organizations (yearly financials, hierarchical reporting, delay penalty clauses). Some structures that affect our team processes (like Agile or Lean) include the trust/respect relationship our manager has with his or her own peers. Another is the contract we have with our VIP client. Yet another is the architecture of our product. Every process must exist and succeed within the structures that constrain it. Forgetting that, or merely denying it until too late, can lead to the feel and appearance of success until things start to fall apart. 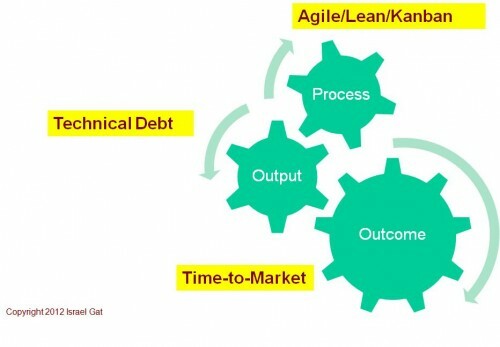 For example, Agile pilot teams can thrive right up until the moment when the rest of the organization is supposed to adopt the new code and new way of doing things. The existing structures have been either tolerating, misunderstanding, or undercutting the new process and simply aren’t ready to absorb change that goes against their grain. How do structures constrain processes and outcomes? Here’s another example: imagine being lost in a city. The approaches (processes) available to find your way in this situation are constrained by the structure around this circumstance. Are you on vacation or almost late for an appointment? Is wandering around an adventure or a source of anxiety for you? These internal and external structures will affect how you choose to proceed and judge a valid outcome. Our processes are like little engines that produces stuff. 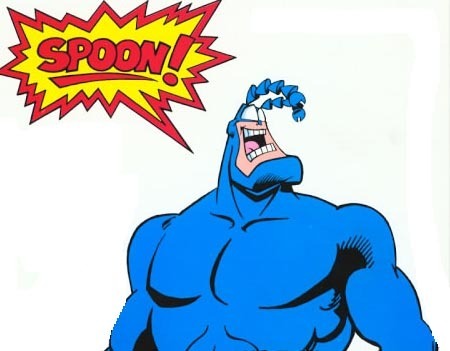 Sometime they do this more or less reliably… but still we go through some actions and have something to show for it. If we only focus on this very direct output of a process, then we can easily miss the connection with everything else downstream from that process — the rest of the system. Israel Gat has created a model that distinguished the output of a process from the outcomes that result. The Structure/Process/Outcome [KMP1] framework uses the name “outcome[KMP2] ” for both the immediate and secondary results of a process. From Israel’s and my own experience, I find that distinguishing more clearly between output (first-order) and outcome (second-order or systemic) results provides much more understanding and insight into what is really happening and why. In fact, it helps change people’s perspective. As an example[KMP3] , consider an Agile team delivering stories at the end of a sprint. If the direct output of “accepted stories” is the only measure paid heed[KMP4] by the team or management, then they will simply apply pressure to work harder, faster, longer … to get more stories finished. Teams can certainly find ways to deliver what is measured and increase the output of accepted stories. Two common secondary outcomes for this circumstance are: 1) the team works overtime[KMP5] and ends up creating more bugs; or 2) a more reasonable team only works on new stories and doesn’t spend enough time learning and exploring. This second outcome is more delayed and harder to see than the first, but it still has a big impact in a competitive and changing landscape. Both of these fit squarely in what systems theory calls “delayed feedback.” If you’ve ever first scalded then frozen yourself in a shower… well, you’ve already experienced this. Humans are really[KMP6] bad at determining cause and effect when delayed feedback is present, and any help we can get in seeing this bigger picture is useful. Outcome is much more important than output. We seldom measure and reward for it, but that is exactly what we should do. Focusing on the outcome [KMP7] gives us both a better measure of success and more freedom to experiment and improve our processes and outputs. This post is intended to help us better understand where we are right now, to more clearly see the full picture[KMP8] . Future posts will examine how and why we change our systems by digging deeper into feedback loops, values, and vision. Note: Private correspondance with both Luke and Israel has turned up essentially the same next thought on scaling these ideas up: expanding and integrating. From Luke the suggestion is multiple interlocked Structure/Process/Outcome frameworks. From Israel the suggestion is shifting focus to integrating across the entire life cycle of a system. Have a diagram you use for understanding or explaining? Want to turn it into an online collaborative tool? See these Instant Play games for examples you can use right now. Of course Gist Labs can help you facilitate games, and design your own custom games.